Disclaimer: this was handed to a co-worker while she waited in line at a Pancake House. She said the guy was staring and making her feel uncomfortable, dropping all sorts of lines that make the Creep Meter overload and self-destruct. This begs the question: how many of these cards does he have? How many has he given out? What kind of pathetic, self-loathing mouse of a woman gets this card and honestly thinks this playa gives a damn about her or the 50 other women that probably call him. I almost wish he’d stepped to me. Seriously pal, do I look like someone who needs your charity? WOW. Either he’s got big brass ones, or a screw loose. Or both. 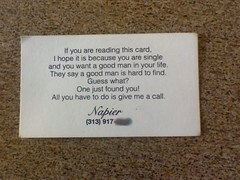 The absolute gall of some guys who believe that all it takes is a business card and a smile. I’ve got to know how many women call back. I feel like setting up a support group for them. Wow. That’s, ah… that’s impressive. And by ‘impressive’, I mean ‘feckin’ creepy’. Why doesn’t he just make a Myspace page like everyone else? And who names their kid Napier? That’s a last name, not a first name. Problem No.1. Also, the Duck’s new layout is most impressive! It’s smoooooth. Why thank you. Still needs some tweaking but I’m mostly satisfied.